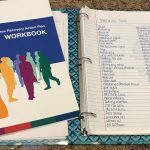 Recently, I started to share how I’m using the new WRAP Workbook (2018 updated edition) to reflect on the last year and to create a new WRAP. My first step was to look at where things stand right now (using the chart on page 20) and identify areas I wanted to change and some steps I could take to change them (using the chart on page 21). 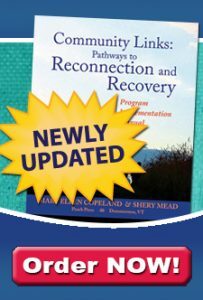 Now, I’ve turned my attention to designing my life to incorporate those adjustments, using the chart on pages 22–25. I journaled about that for a little while to get a clear picture of where I want to be with those areas. Then I turned back to the chart and started working backward to fill in each box. For questions like, “How would I spend my time?” and “How would I feel?” I used my journaling to help me come up with what I wanted to say. For questions like, “What can I do to make sure I’ll spend my time this way?” my action steps from page 21 were a huge help. Once I completed the chart about living life the way I want to live, I flipped back to the beginning of the WRAP Workbook. On page 1, I answered the question “What do I want to accomplish with my WRAP?” based on my answers to the charts. Then I flipped to the wellness toolbox (page 4) and started writing down all the tools that would help me achieve the goals I set for myself for the next year. Some of these came from my original list of wellness tools, but some are new. For example, one of the new wellness tools I’d like to try is CrossFit. Another is watercolor painting. For my daily plan, I used my journaling and my charts to describe what I would look like if I were really living life the way I want to. Then I used my action steps to write out what I need to do every day and what might help on some days to keep me moving forward and on track with what I’m creating for myself. When I moved on to stressors (page 6), I used my original list of “triggers” and some new ideas from the charts in the back (page 24, “What’s stopping me?”) to think through what could throw me off track and how I can use my wellness tools to respond. I continued this way through the whole WRAP Workbook. With a fresh start from looking at my goals and things I want to change right now, my new WRAP feels like just what I need to make 2019 the kind of year I want it to be. Next time, I’ll share how I’m planning to use my WRAP and my paper planner (getting a paper planner for 2019 is one of my action steps!) to stay on track with my daily plan and make sure I do the things I want to do with my life in the coming months. But first, I’d love to hear from you. Are you updating your WRAP for the new year? What are you working on for next year? What might be in the way? How can the WRAP community support you? Please leave a comment on our Facebook page with your ideas and questions.